Vaclav Smil: Our transition away from fossil fuels will take decades—if it happens at all. Posted in An Overview, Infrastructure, Vaclav Smil	| Tagged diesel engine, energy transition, vaclav smil	| Comments Off on Vaclav Smil: Our transition away from fossil fuels will take decades—if it happens at all. Why do political, economic, and scientific leaders deny Peak Oil and Limits to Growth? The Oiliness of Everything: Invisible Oil and Energy Payback Time. Energy Overview. Oil is butter-fried-steak wrapped in bacon. Alternative Energy is lettuce. 1) How much fossil fuel energy is burned? In 2013, the United States burned 96.5 quads (96.5 quadrillion BTU’s) of energy a year, 84% was fossil fuels: 36 petroleum, 26 natural gas, 18.5 coal. In 2013, the United States generated about 4,058 billion kilowatt hours of electricity, 67% from fossil fuels (coal 39%, natural gas 27%, and petroleum 1%), 19% nuclear, and 7% hydropower. Renewables are a tiny fraction of that, with biomass at 1.48%, geothermal 0.41%, solar 0.23%, wind 4.13%. At the rate they’re growing, it would take thousands of years to replace fossils, which since 2013 have continued to grow in overall energy production far more than renewables. Electricity is just 15% of our energy use. So using wind and solar to replace the 67% of electricity from fossil fuels doesn’t make even a tiny dent in the way the other 85% of energy is used which comes from fossil fuels, for essentials such as transportation, manufacturing, and heating. 2) This is a liquid fuel crisis because nearly all FREIGHT transportation runs on oil, mainly diesel. I like to fly and drive cars, but they don’t plant, harvest, and deliver food — tractors, harvesters, and trucks do that. We might not like it, but we can live without cars and airplanes. But not without trucks, railroads, and ships. These billions of diesel-engine-powered vehicles and equipment represent trillions of dollars of investment with lifespans of 20 to 40 years, so you can’t just wave a magic wand and instantly replace them, and their billions of tons of steel, copper, aluminum, and so on, which also require energy. Diesel is available at over 160,000 service stations in the U.S. alone. Whatever you think a “something else” might be, that’s a huge distribution system that also has to be replaced. 3) We can’t electrify the transportation that matters most: medium and heavy trucks, tractors and harvesters, ships, mining equipment, etc. Batteries and fuel cells aren’t energy carriers – they store the electrical energy generated mainly by non-renewable natural gas and coal. Diesel & gasoline (46 MJ/kg) have up to 92 times the energy density of a lithium battery and 271 times the energy density of a lead-acid battery. A truck can’t move even an inch with a battery 92 to 271 times the size and weight of its current diesel-fuel containing tank. The maximum possible energy density, according to laws of physics and thermodynamics, of a perfect battery is 3 MJ/kg, which is still 15.3 times less than diesel, so you’d still need a “gas” tank 15.3 times larger. I explain in “Who Killed the Electric Car” why it’s unlikely such a battery will ever be developed. And the lifespan of batteries isn’t nearly as long as diesel engines. Read all about it in “Diesel is finite. Trucks are the bedrock of civilization. So where are the battery electric trucks?” and the related article links within. Oil is a butter fried steak wrapped in bacon. Solar, Wind, and most other alternative energy resources are lettuce. You’d get all of your 2,000 calories a day from one and a quarter pounds of bacon-wrapped steak, versus 31 pounds of lettuce. Oil is second only to uranium in energy density. This is because a gallon of gas comes from 100 tons of prehistoric plant matter (40 acres of wheat), condensed like moonshine over millions of years into the densest form of solar energy on the planet. If you look at just the gasoline consumed every year in America, 131 billion gallons, that’s equal to 25 quadrillion pounds of prehistoric biomass. Oil has extremely high energy density, and is the most convenient form of energy ever discovered. As a liquid, it’s easily stored, transported, and used. It’s wonderfully combustible, but with a high enough flashpoint that it doesn’t explode easily. Oil is a liquid, easily transported in pipelines (by far the least energy to move versus rail, truck, or ship). It takes very little time to pour gas or diesel into a vehicle gas tank. Compared to natural gas or hydrogen, petroleum takes up very little space. Solids like wood, coal, oil shale, and biomass can’t be put into a pipeline (the cheapest way to move energy), and it takes energy to convert them to a liquid fuel. They’re less convenient to transport than a liquid or gas. Gases take up so much space, you need to compress or liquefy them, and that takes both energy and time. Energy from wind or solar can’t easily be transported, first you have to build apparatus to harness the wind or sun, then you have to convert the energy to something that can travel, such as electricity, which requires an expensive electric grid. For example, consider a windmill. A windmill farm in the Escalante desert, built to produce 5.55 TWh of power, would require 13.8 million pounds of aluminum, 2.8 trillion pounds of concrete, 639 billion pounds of steel, etc. The wind farm would occupy over 189 square miles. In 1992 dollars such a wind farm would cost $200 million, which doesn’t include labor, future operational, and maintenance costs, and would serve less than 1% of the United States population (Pacca). After fossil fuels are gone, the windmills must be able to generate enough energy to maintain themselves and reproduce new windmills, including all of the equipment and tools used to mine the metal and concrete, forge metal into blades and towers, the energy needed to deliver 8,000 parts from all over the globe by ship, rail, or truck and build/maintain all ships, railroads, and trucks (which corrode/rust and need replacement every 6 (trucks) to 29 (ships) years, and the roads the trucks drive on to deliver the windmills to be delivered to their sites. Windmill energy must also provide the energy to build and maintain the electric grid and storage infrastructure, and all of the workers involved in the process from birth, to school, to the vehicles they arrive at work in 18+ years later. Any extra energy generated beyond these needs can now be used to run the rest civilization. 9) At the heart of our dilemma is the fact that Oil is the MASTER RESOURCE that UNLOCKS ALL OTHER RESOURCES. As long as you have oil, you can go to the most distant parts of the ocean to find the last schools of fish with sonar and spotting planes. Food is grown with oil-based pesticides, planted, harvested, distributed, packaged, cooked, and so on with fossil fuels. When oil declines, where will we get the energy to do phenomenal things like moving The Tallest structure ever moved by Mankind? 10) TIME. We’re running out of it. The Department of Energy paid Robert Hirsch to do a Peak Oil study in 2005. Hirsch concluded you’d want to start at least 10, or better yet, 20 years ahead of time before peak oil to prepare for the transition to other energy resources. Conventional oil peaked world-wide in 2005 (Kerr 2011, Murray, IEA World Energy Outlook 2010) and we’ve been on a plateau ever since then. We don’t have 10 or 20 years. Unconventional oil is nasty, heavy, difficult and very expensive to get at and has a very slow rate of flow — very soon (between now and 2025) it will not be able to make up for the decline rate of conventional oil. The National Resource Council noted that we don’t have enough natural-gas to use as a feedstock for transportation-fuel production. So we’d have to import it and we don’t have the infrastructure to do that or distribute it. We also increasingly are using natural gas for electricity production and to keep the grid from blowing up from intermittent alternative energy like wind and solar with NGCC plants. Natural Gas vehicles aren’t a solution — there aren’t enough fueling stations, and the tanks take up most of the trunk space, their range is at best 100-150 miles, and the public thinks of natural gas as too explosive. Local truck fleets can use CNG and LNG or diesel made with GTL, but there just isn’t enough natural gas in the USA for this to last very long – the fracking boom is temporary. So it doesn’t make much sense to build fleets of trucks that can use CNG at a time when supplies are about to end, and NG is also needed to generate electricity and balance wind and solar power. CNG/LNG aren’t likely to be added to over 100,000 gas stations either. Coal-to-liquids would use half the energy contained in the coal to make it and require doubling of coal production. If Carbon sequestration were used, then another 40% of the energy would be used. 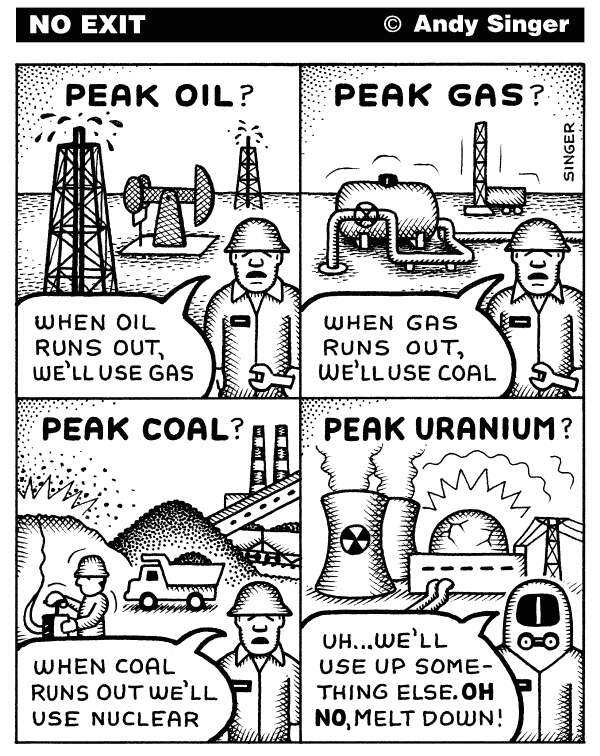 Oh, and we’re at peak coal too, certainly energy-wise – we’ve used most of the easy, high-energy coal. More research needs to be done to determine exactly what the reserves are now though, since it hasn’t been done since 1974. But the few studies done since then have found less reserves, not more in the areas studied. Dimethyl ether (DME) has about half the energy content of diesel fuel, so a truck will have to carry about twice the amount of DME for a given range – a penalty that’s worse than CNG and LNG. Two gallons of DME weigh 11 pounds compared to diesel’s 7.5 pounds, so a DME-fueled truck or tractor will be heavier than a diesel-fueled truck, and is better suited to local than long-haul distances. Diesel engines need a special injection system and different cylinder heads to handle the high fuel flow of DME, and steel fuel tanks to store it aboard a truck. The refining process from natural gas to DME may have too high an EROEI as well. As with other gas-to-liquids processes, the first step is conversion to syngas, a mixture of hydrogen, carbon monoxide, and carbon dioxide. This syngas is then synthesized into methanol. Finally, DME is produced through a methanol dehydration reaction.The primary challenge facing the use of DME is the lack of an infrastructure for distribution. Other disadvantages include low viscosity, poor lubricity, a propensity to swell rubber and cause leaks, and lower heating value compared with conventional diesel (NAS 2009). DME costs twice as much to make as methanol, an intermediate product in the methane-to-DME refining process, and is also more expensive to make than diesel fuel, so refiners prefer to sell methanol. DME is mainly used as aerosol propellant to replace chloroflurocarbons in paints and cosmetics. World-wide production of DME in the world is less than 150,000 tons per year. Can we really afford to spend trillions on new vehicles and renewable energy and fix our broken infrastructure, and pay for medicare, social security, and so on? How much energy will be needed to fight wars to keep the oil flowing? There’s a lot of social opposition to building new dams, LNG facilities, wind turbines, and so on. Renewables are far worse off than fossil fuels and even wood when it comes to another crucial energy quality: continuity of supply. A coal-fired power plant can be cranked up as needed; not so sun or wind. Coal-fired, gas-fired, or nuclear power plants operate 75% to 90% of the time. But wind turbines typically operate between 20 and 35% of the time. The sun is always unavailable half the time, plus whenever there’s cloud cover. Often wind power or solar power is generated when it is least needed, wind power at night, and solar power much less in the winter when there’s both less sunshine and the angle of the sun generate less power. Worse yet, building wind and solar doesn’t mean you can get rid of coal, natural gas, or nuclear power plants at all. In fact, often utilities have to build natural gas combined cycle plants to quickly kick in to make up for the power lost when the wind stops blowing or the sun stops shining. Renewable energy adds unprecedented levels of stress to a grid designed for the previous century. Green energy is the least predictable kind. “The grid was not built for renewables,” said Trieu Mai, senior analyst at the National Renewable Energy Laboratory. The role of the grid is to keep the supply of power steady and predictable. Engineers carefully calibrate how much juice to feed into the system as everything from porch lights to factory machines are switched on and off. The balancing requires painstaking precision. A momentary overload can crash the system (Halper). Engineers haven’t yet developed energy storage devices suitable for storing solar and wind power, and they would add to the ultimate cost. Many of the windiest and sunny regions in the world are virtually uninhabited, so electricity would have to be moved long distances to cities. The same patchiness holds for other renewables, from geothermal to hydro energy. For biomass, everyone has some arable land for growing energy crops, but much of it is already spoken for. And even if the land were available, energy crop yields would fall short of the need. Check out this post by Roger Andrews, Renewable Energy Growth in Perspective, which shows how insignificant wind and solar are in the amount of overall energy used by society (and hydro and geothermal as well). You have to build windmills to harness wind, solar plants to harness solar power. These apparatus need all kinds of materials depleting faster than even oil, coal, and natural gas. There isn’t a single object or step that doesn’t have fossil fuel inputs – ore is mined with ore trucks, crushed to extract the ore, smelted, fabricated, delivered. Biofuels deplete topsoil and aquifers, nuclear energy plants can melt down and there’s nowhere to put the waste, dams displace people, mining the metals for wind and solar PV harm the environment, and so on. Dams emit a lot of carbon dioxide during construction from the massive use of cement, methane is released from drowned plants, habitat is destroyed, water quality changes, gravel and sand are trapped behind the dam walls, affecting beaches, estuaries, and rivers downstream, prevent salmon from spawning, and so on. Any kind of reactor that uses water to cool down with (coal, nuclear) heats the water which can harm the habitat. 6) Is the resource renewable? What’s the point in replacing fossil fuels with something temporary? We want something sustainable that will last forever. Wind and sunlight are renewable, but the equipment to capture the wind and sunshine are not renewable, because the equipment requires non-renewable metals, minerals, and significant amounts of non-renewable oil, coal, and natural gas to make. 8) Is the resource close enough to get? We’ve built millions of miles of natural gas pipelines at over a million dollars per mile. There are a lot of natural gas reservoirs we’d love to exploit, but it would cost too much to run pipelines to them, more than what the natural gas could be sold for. Most of our wind is in Montana, North Dakota, and South Dakota, far from the big cities where people live. The cost of harvesting wind in these states and building up the electric grid to deliver the electricity is simply too much money, plus 10% of the electricity is lost as it travels such long distances. And as we heat up from climate change, the risk of the wires starting forest fires grows. Solar power is best in the far Southwest, again, far from the main population centers (except for southern California and Arizona). Most of the power from the ocean (Wave, Tide, Ocean Current, OTEC) or rivers is too far to hook up to the electric power grid (and vulnerable to corrosion, hurricanes, large waves, bio-fouling, high capital costs, etc). Weight density. An electric battery typically is able to store and deliver only about 0.1 to 0.5 MJ/kg, and this is why electric batteries are problematic in transport applications: they are very heavy in relation to their energy output. Thus electric cars tend to have limited driving ranges. Volume (or Volumetric) Density This refers to the amount of energy that can be derived from a given volume unit of an energy resource (e.g., MJ per liter). Obviously, gaseous fuels will tend to have lower volumetric energy density than solid or liquid fuels. Natural gas has about .035 MJ per liter at sea level atmospheric pressure, and 6.2 MJ/l when pressurized to 200 atmospheres. Oil, though, can deliver about 37 MJ/l. In most instances, weight density is more important than volume density; however, for certain applications the latter can be decisive. For example, fueling airliners with hydrogen, which has high energy density by weight, would be problematic because it is a highly diffuse gas at common temperatures and surface atmospheric pressure; indeed a hydrogen airliner would require very large tanks even if the hydrogen were super-cooled and highly pressurized. The greater ease of transporting a fuel of higher volume density is reflected in the fact that oil moved by tanker is traded globally in large quantities, while the global tanker trade in natural gas is relatively small. Consumers and producers are willing to pay a premium for energy resources of higher volumetric density. Area density This expresses how much energy can be obtained from a given land area (e.g., an acre) when the energy resource is in its original state. For example, the area energy density of wood as it grows in a forest is roughly 1 to 5 million MJ per acre. Area energy density matters because energy sources that are already highly concentrated in their original form generally require less investment and effort to be put to use. If the energy content of the resource is spread out, then it costs more to obtain the energy, because a firm has to use highly mobile extraction capital [machinery], which must be smaller and so cannot enjoy increasing returns to scale. If the energy is concentrated, then it costs less to obtain because a firm can use larger-scale immobile capital that can capture increasing returns to scale. Thus energy producers will be willing to pay an extra premium for energy resources that have high area density, such as oil that will be refined into gasoline, over ones that are more widely dispersed, such as corn that is meant to be made into ethanol. At the start of the oil age, the net energy — the amount produced versus how much energy was used to produce it was 100:1. That left 99 other units of energy to build houses, roads, bridges, airports, railroads, schools, hospitals, drinking water and sewage treatment plants, chemicals, amusement parks, drive across the country, heat and cool structures, build millions of electronic gadgets, toys, and so on. Charles A. S. Hall estimates you’d need an EROEI of at least 12 to 13:1 to run civilization as we know it. Solar PV has an EROEI of only 2.45 in sunny Spain, and somewhere between 1.6 and 2 in Germany. The amount of useful energy that’s left over after the amount of energy invested to drill, pipe, refine, or build infrastructure (including solar panels, wind turbines, dams, nuclear reactors, or drilling rigs) has been subtracted from the total amount of energy produced from a given source. If 10 units of energy are “invested” to develop additional energy sources, then one hopes for 20 units or 50 or 100 units to result. “Energy out” must exceed “energy in,” by as much as possible. Net energy is what’s left over that can be employed to actually do further work. It can be thought of as the “profit” from the investment of energy resources in seeking new energy. The net energy concept bears an obvious resemblance to a concept familiar to every economist or businessperson—return on investment, or ROI. Every investor knows that it takes money to make money; every business manager is keenly aware of the importance of maintaining a positive ROI; and every venture capitalist appreciates the potential profitability of a venture with a high ROI. Maintaining a positive energy return on energy invested (EROEI) is just as important for energy producers, and for society as a whole. The transition to alternative energy sources must be negotiated while there is still sufficient net energy available to continue powering society while at the same time providing energy for the transition process itself. Heinberg prefers EROEI over EROI because the latter might lead readers to think it means energy returned on money invested. Money is meaningless, an abstract concept to grease the wheels of commerce, not something you can put in your gas tank and drive on. It’s best to leave money out of net energy (EROEI) considerations. I don’t use EROEI as much as I’d like to because people just don’t get it, and change the discussion, or reply with objections in terms of money, which they’re more familiar with. I also despair of discussions about EROEI, because corporate scientists who always publish in non-peer-reviewed journals easily fool the public by setting the boundaries too narrowly. For instance, researchers who found ethanol production to have a positive EROEI above 1:1 only considered the energy used at the ethanol refinery. They left out the energy to make tractors, the energy to plant, fertilize, harvest, and deliver the corn to the ethanol plant, and trucks and trains delivering the ethanol after it’s been made (it can’t go in a pipeline). Another problem is that the EROEI of each wind or solar plant will vary depending on how old it is, where it is, and so on. Back when we depended on wood before coal, and grew all of our food, it took 90% of the population to produce enough food to feed themselves and another 10% of town folk who were merchants, artists, soldiers, or gentry. Even as recently as 1850 over 65% of work done was muscle-powered, versus only 1% today now that machines do most of the work. Just 1 liter of oil is equal to a person working two weeks of 10-hour days (Pimentel). “Today’s lead acid batteries can store about 0.1 mega-joules per kilogram: 500 times less than crude oil (50 MJ/k). Lithium ion batteries are able to deliver .5 mega-joules per kilogram: 100 times less than oil. The theoretical maximum a battery could ever deliver is 5 mega-joules per kilogram, 10 times less energy than oil”, according to Kurt Zenz House, Chief Executive of C12 Energy. Who cares about cars? Since the billions of diesel engines that do all of the work of society that keeps us alive — tractors, harvesters, trucks, trains, and ships can’t be converted to run on electricity, we’re back to the age of wood again, and 2 billion people or less on the planet. Table 1b. Estimated LCOE (simple a verage of regional values) for new generation resources, for plants entering service in 2022 Source: EIA. August 2016. Levelized Cost and Levelized Avoided Cost of New Generation Resources in the Annual Energy Outlook 2016. Energy Information Administration. Power that’s dependable and available whenever you want it around the clock if need be (high capacity factor) is more valuable than intermittent, unpredictable, variable power like wind and solar. The EIA doesn’t consider hydropower dispatchable because it varies seasonally and is often not available since it’s being held back for agriculture, drinking water, and maintaining a healthy ecology, especially for the fishing industry. Wind and solar power DEPEND on backup power, from mostly natural gas (because coal and nuclear don’t ramp up and down quickly enough) to keep the electric grid in exact balance between supply and demand. Some fraction of the LCOE for fossil and nuclear plants and energy storage should be added to the LCOE costs of wind and solar since they can’t exist on their own. Hydropower capacity is 37.3%, not 58%. Wind capacity is 33%, not 40%, and since most of the best wind is already built out in most states, it is likely wind capacity will go DOWN in the future. Natural gas production is expected to peak in 2020, yet huge amounts of coal and nuclear plants have already retired or will over the next 20 years, which accelerates depletion even faster. Coal plants can’t come back because we are 1) past peak coal, 2) Carbon Capture and Storage (CCS) technology is far from commercial and 3) uses far too much energy to ever be commercial, about 40% of the power generated. Heinberg, Richard. September 2009. Searching for a Miracle. “Net Energy” Limits & the Fate of Industrial Society. Post Carbon Instutite. Heinberg concludes there will be no combination of alternative energy solutions that might enable the long term continuation of economic growth, or of industrial societies in their present form and scale. Also go to the energy and books sections of energyskeptic to get more detailed information on specific kinds of energy. The only hope to replace the problem we face — the need for liquid transportation fuels — would be biomass converted to diesel. We don’t have enough biomass to do this. Even if you burned every single plant in America, including their roots – which is much more energy producing than converting all of this biomass to liquid fuels, you would still produce less energy than we burn in a year, and you’d be left with a barren moonscape. Biofuels have a low EROEI (possibly negative in fact), and are tremendously ecologically destructive — they deplete topsoil, aquifers, are the 3rd major source of carbon dioxide from cutting down rainforests to grow palm oil, runoff of fertilizer to grow biomass creates vast dead zones in waterways, make food prices far more expensive as corn is diverted to make fuel instead, and much more (see “Peak Soil“). Howard Hayden. 2005. The Solar Fraud: Why Solar Energy Won’t Run the World. Second Edition. Ted Trainer. 2010. Renewable Energy Cannot Sustain a Consumer Society. Bucknell III, Howard. 1981. Energy and the National Defense. University of Kentucky Press. Halper, E. Dec 2, 2013.Power struggle: Green energy versus a grid that’s not ready. Minders of a fragile national power grid say the rush to renewable energy might actually make it harder to keep the lights on. Los Angeles Times. Huber, Peter. Nov 27, 2006. Love Uranium. Forbes. IEA World Energy Outlook 2010 (world oil peaked in 2006). Kerr, Richard. 13 Aug 2010. Do We Have the Energy For the Next Transition? Past energy transitions to inherently attractive fossil fuels took half a century; moving the world to cleaner fuels could be harder and slower. Science Vol 329. NAS 2009. America’s Energy Future: Technology and Transformation. 2009. National Academy of Sciences, National Research Council, National Academy of Engineering. Pacca, S. et al. July 15, 2002. Greenhouse Gas Emissions from Building & Operating Electric Power Plants. Environ Sci Technology 36(14):3194-200. Pimentel, David et al. 2008. Food, Energy and Society,Third Edition.